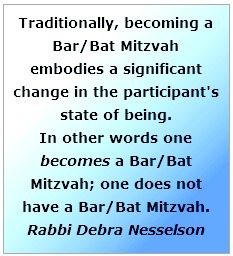 Becoming a Bar/Bat Mitzvah signifies the beginning of that individual's more mature journey into Jewish life with its myriad of possible manifestations. There are many ways to be Jewish. To that end, I work closely with the individual preparing for his/her Bar/Bat Mitzvah together with the family and whatever other educators are involved. My services include working closely with the family to tailor the process specifically to individual needs, getting to know and learn with the Bar/Bat Mitzvah individual, conducting two rehearsals, the Bar/Bat Mitzvah service itself and continued post Bar/Bat Mitzvah contact in an effort to help guide the individual's Jewish journey. Becoming a Bar/Bat Mitzvah is so much more than the party; done properly and thoughtfully, it can be the beginning of a life deeply rooted in Judaism and being Jewish. A Bar/Bat Mitzvah can be held anywhere. Learn more - ask Rabbi Nesselson. "It was truly amazing, everything we could have hoped for. " ​it was the most beautiful service they have been to..."
"...thank you for giving our daughter such a truly wonderful Bat Mitzvah education and experience..."
"(We) have never really had a Rabbi that we could identify with. ​You are most definitely it." "...you made our special day even more special and meaningful..."